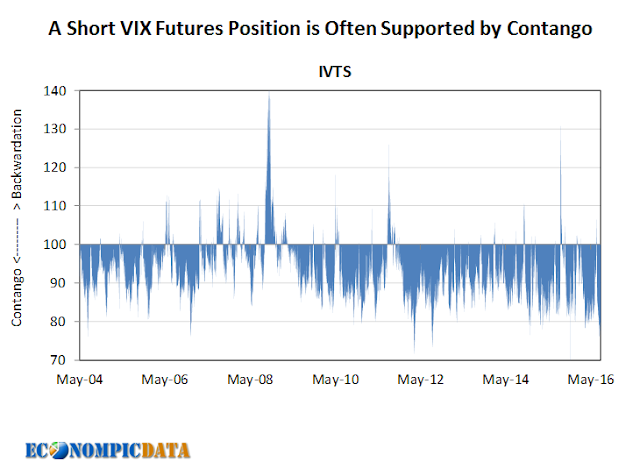 The chart below shows the steepness of the VIX futures term structure. Anything below 100 means the value of the CBOE 1-Month Volatility Index (VIX) is less than the CBOE 3-Month Volatility Index (VXV). This is typically the case to compensate the seller for uncertainty, which benefits a short VIX position (all else equal). 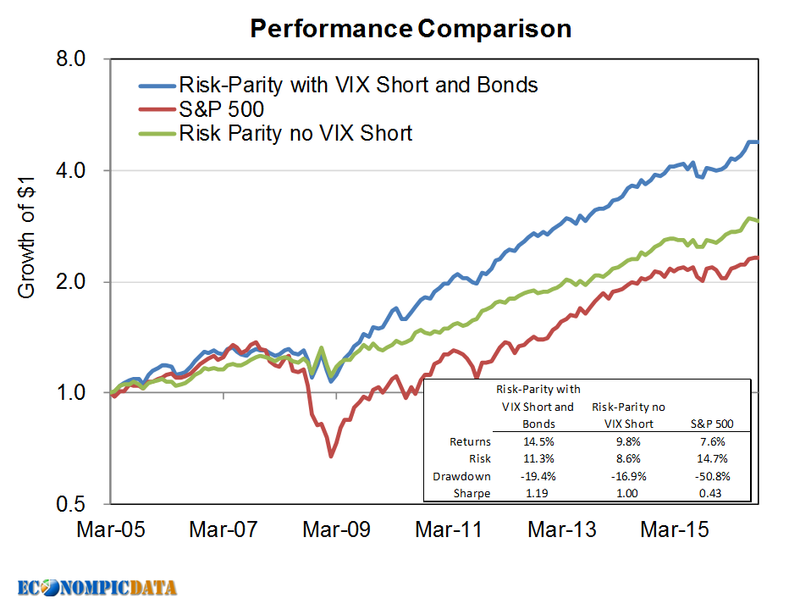 Given these historical structural advantages of a VIX short, I thought it would be of interest to share how one might make an allocation within a portfolio to capture these benefits while maintaining characteristics of a long stock position. The below analysis goes back roughly to the inception of VIX futures and carves out a portion of a stock allocation for a short VIX position via the S&P 500 VIX Short-term Futures Inverse Index (the index for ETPs XIV and SVXY). 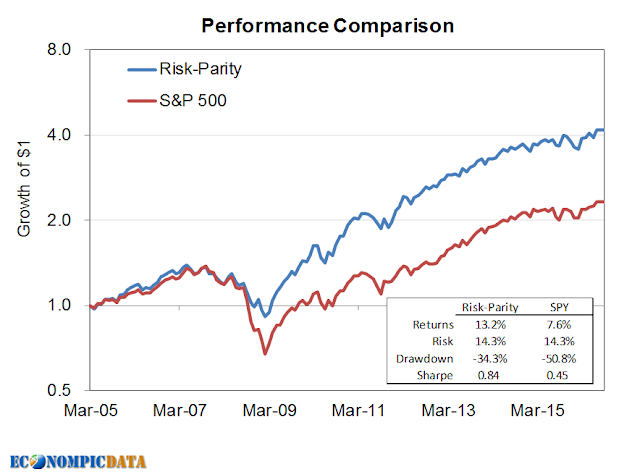 An investor can simply carve out a percentage of their allocation (call it 10% or 20%) and call it a day, but a risk weighting scheme has historically added about 1% to returns per year, while reducing risk, and it provides a framework for how one might add additional asset classes to the mix (also shown below). 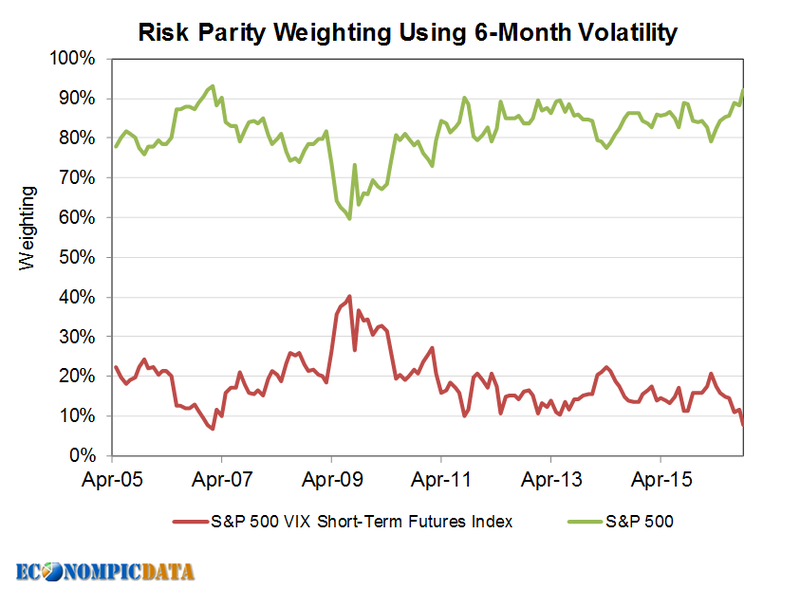 Weight next month exposure to the S&P 500 and S&P 500 VIX Short-term Futures Inverse Index by risk weighting based on historical 6-month standard deviation (using month-end data) and rebalance monthly. 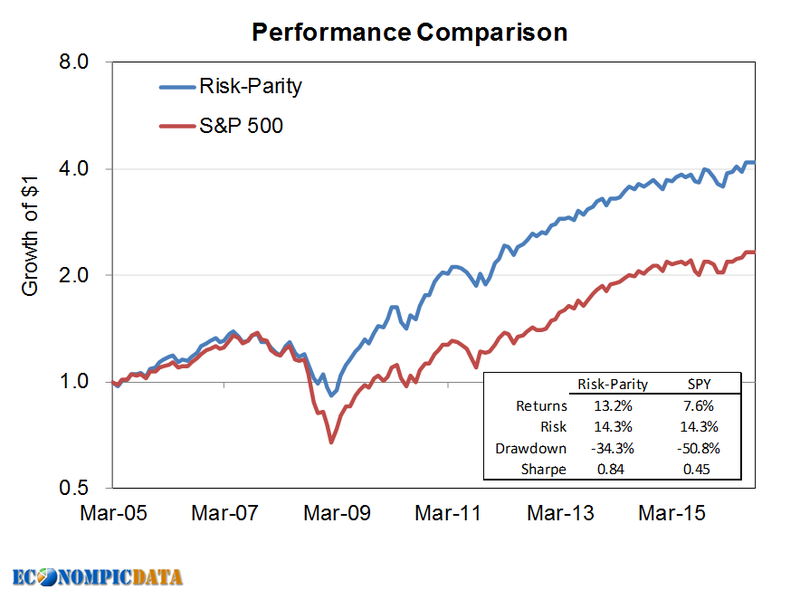 Note that this framework resulted in higher modeled performance with better risk-adjusted returns (higher sharpe ratio), though it did come with higher risk in the form of higher standard deviation and higher drawdown. Instead of a static short to VIX futures, version 2.0 allocates to the short VIX position only when the term structure favors a short on a daily basis (i.e. when the previous close was in contango - see chart above or here for more about investing based on the term structure - the weight remains determined by the previous month-end). The modeled results are improved (higher return, higher risk-adjusted return, and lower drawdown), but overall risk in terms of standard deviation remains higher as well. This iteration takes the rules from version 2.0 and waters down the weight of both stocks and bonds with cash to match risk profile of the S&P 500 (note - this is absolutely data mined or I wouldn't have known a ~70% weight to the results from version 2.0 and 30% to t-bills would have resulted in the 14.3% standard deviation of the S&P 500). The modeled portfolio is improved in just about every manner and has an additional 30% of the portfolio now sitting in cash that is available for an alternative allocation. 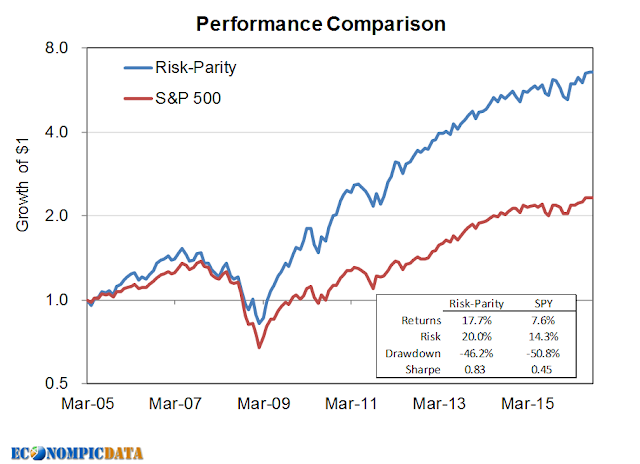 Note a 37.5% weight gets to the same 7.6% return and results in a standard deviation of almost 1/2 that of the S&P 500 and drawdowns of only 1/3 that of the S&P 500. 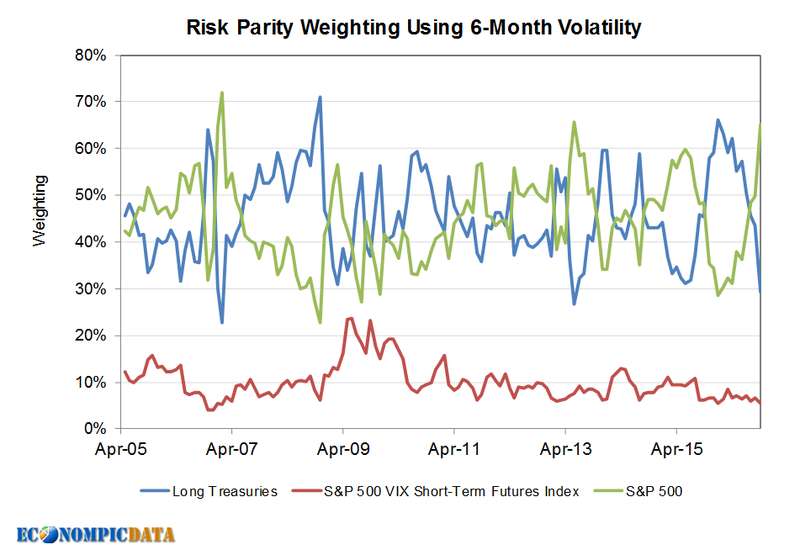 This iteration takes the rules from version 1.0 (a static VIX short, even if the VIX term structure is in backwardation), but throws long bonds in the mix. 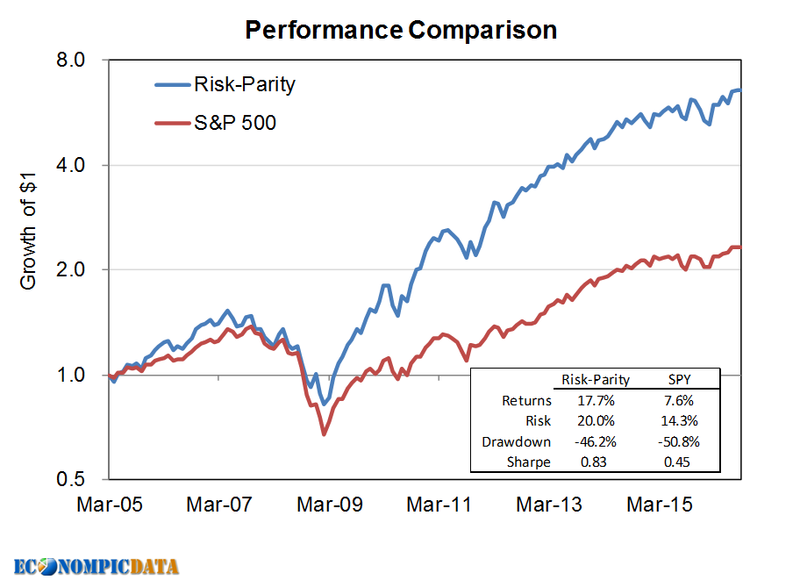 This is more akin to traditional risk parity, so I included the performance of a stock / bond risk parity iteration in the performance chart below as well (i.e. 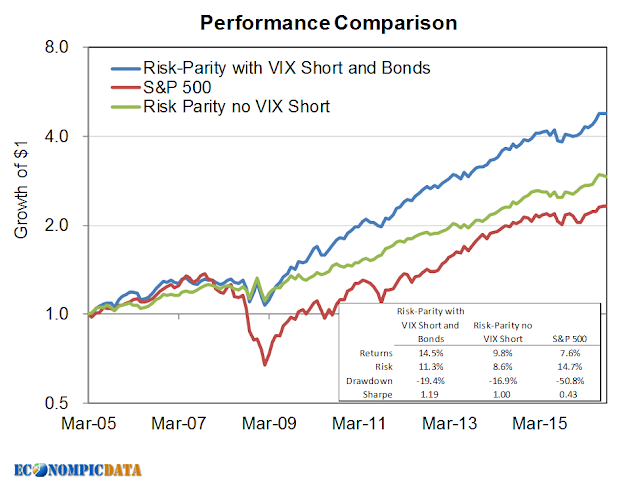 an allocation excluding the VIX short). The result is an improved sharpe ratio, largely due to the negative correlation of bonds with stocks over this time frame, and more "bang for your buck" that even a small unlevered allocation to a high volatility VIX short provides (more was written on that feature here). 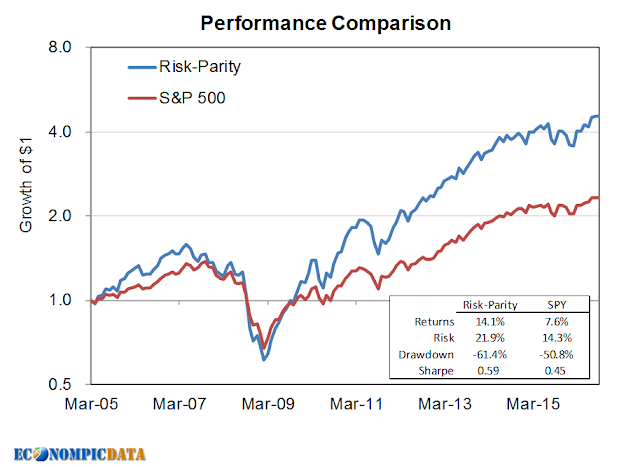 Please note this has been the golden age of risk parity, thus this level of performance is unlikely to continue. Pensions and Investments wrote about the interest pension plans have shown in put writing (seemingly one of the more misunderstood investment strategies out there) in a recent article Funds Go Exotic with Put-write Options to Stem Volatility. I thought the article did a nice job of outlining the case for the strategy as a risk reducing equity alternative. 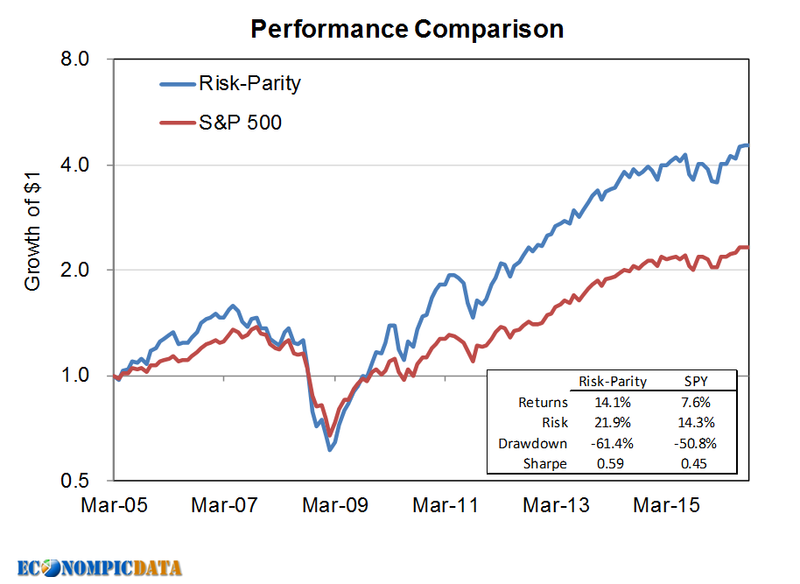 In this post I'll outline why current valuations among U.S. stocks may actually make the trade-off even more interesting (than normal) relative to an allocation to the S&P 500. For a deeper dive into what put writing entails, including how they have the same economic exposure as covered calls... see past posts here and here. But Shorting Naked Options Sounds Scary... How Can They Reduce Risk Relative to Stocks? I regularly see articles / posts / tweets outlining the "complexity" and/or "danger" of put writing. Pension funds in Hawaii and South Carolina are plying an arcane options strategy called cash-secured put writing. If an investor holds a stock and writes call options (a strategy referred to as covered calls), the investor gives up potential upside if the option is called. Assuming the investor wrote the contracts with a strike price above what the stock cost to acquire, a profit is made, though a smaller profit than could have been made if the contract hadn’t been written. In reality... writing puts simply converts the upside potential of the stock market to a premium collected up front, while the downside (excluding the premium collected) remains the same. 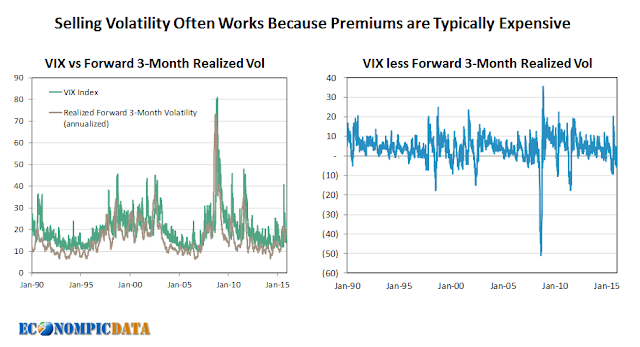 The result is a more consistent return stream (the premium collected cushions / offsets the downside when markets sell-off) while it has kept up with the S&P 500 since inception (despite the lower risk profile), given volatility is routinely overpriced by the market. In addition, puts tend to be priced more expensively than calls (in part) because they are less understood by investors, thus put writing has historically outperformed covered calls. The put-write strategy serves both as protection against downside risk and volatility but has the added bonus of providing income, said Frank Tirado, vice president of education, Options Industry Council, Chicago. 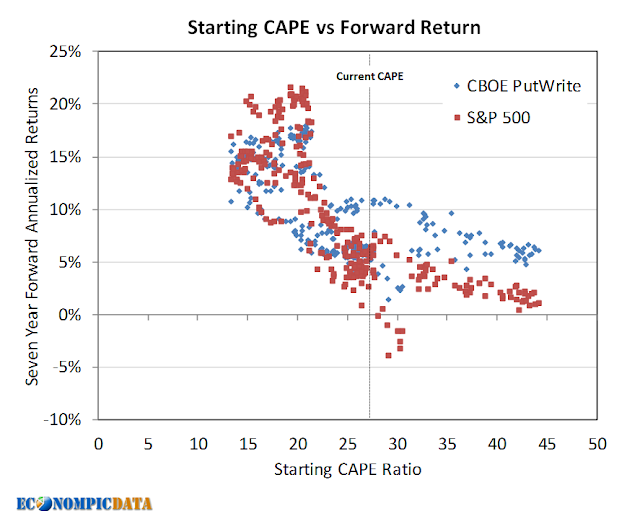 The data bears this out... going back to the CBOE PutWrite Index' 1986 inception, the S&P 500 has outperformed put writing when valuations were cheap and has underperformed put writing when valuations were expensive. 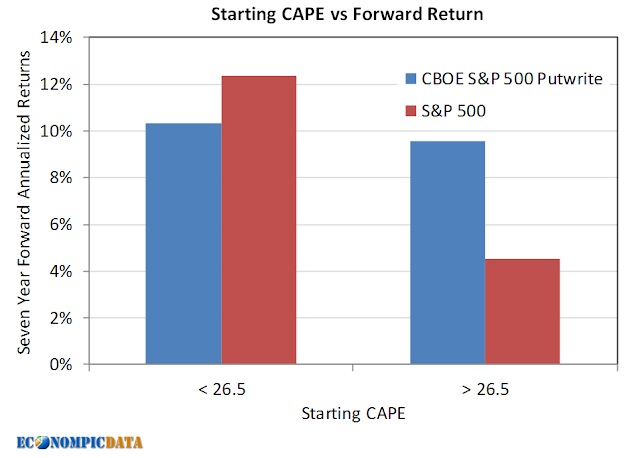 In fact, while the S&P 500's forward return has varied by almost 8 points when the CAPE was below / above it's current 26.5 level, the forward seven year return of put writing has hardly varied when below / above this same 26.5 level. Scatter plot of starting CAPE vs forward seven year CBOE PutWrite and S&P 500 returns. Starting CAPE vs forward seven year CBOE PutWrite and S&P 500 returns.